The word on the grapevine is that 2016 is the year of the Babka, a brioche like yeasted cake or bread. When I told my husband about this, he exclaimed with great joy, “oh that’s Polish”, and after doing a little research, it appears that this bread is served at major holiday events such as Christmas and Easter across central and eastern Europe. However, (yes there is always a ‘however’ in my world) I didn’t want to make what everyone else is making. I want to be different this Easter. With all the interest in Babkas, and places like Pinterest and Instagram being flooded with images of chocolate orange Babkas and pistachio and lime Babkas, I was reminded of some of my earlier food memories while growing up. When I was living in London at the ripe old age of around 10 years old, we lived opposite a delicatessen called Elizabeth Kings in Fulham, and every Saturday my mother and I would head across and buy some weekend treats. I now vividly remember the ‘Couronne’ which I would spend ages choosing (based on nuttiness and the amount of glaze that adorned on top of it). This bread is quite similar to what we all know as the Babka. 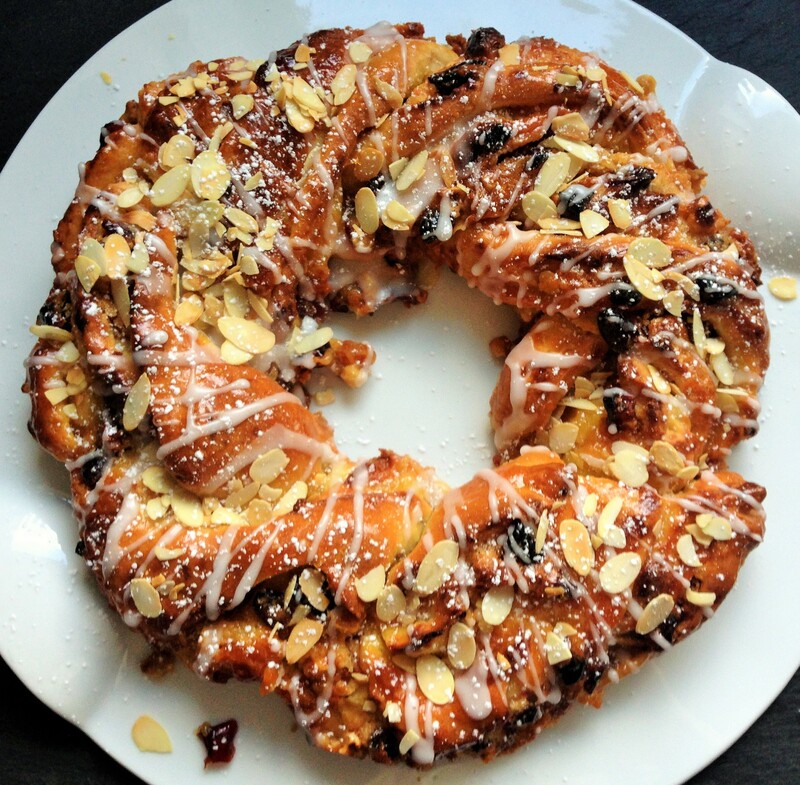 It is a yeasted sweet bread, studded with fruit and marzipan and traditionally made in a round wreath like shape. It too is a celebratory bread but originates from France. I would get one of these every Saturday and reluctantly let anyone share in the explosion of flavour you got once it hit your mouth. I had totally forgotten this memory and this bread until a few weeks ago when in the last week of my pregnancy, I suddenly had a craving for it. Thankfully my mother was able to help me remember what it was called. 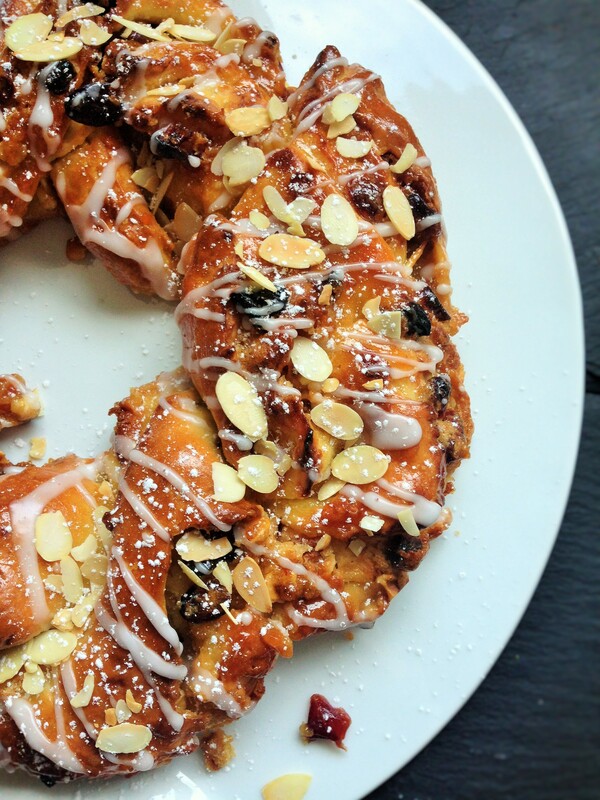 So instead of making Babka, I present to you a fantastic alternative: The couronne! A sweet, fruity and nutty bread, perfect for any Easter table. I’m not a huge fan of dried fruits. But in this bread, I simply love them. You can vary the fruits used, but these would be my favourites. You can also add extra flavour by adding grated orange zest to your dough, but I’m not a huge fan so left it out. 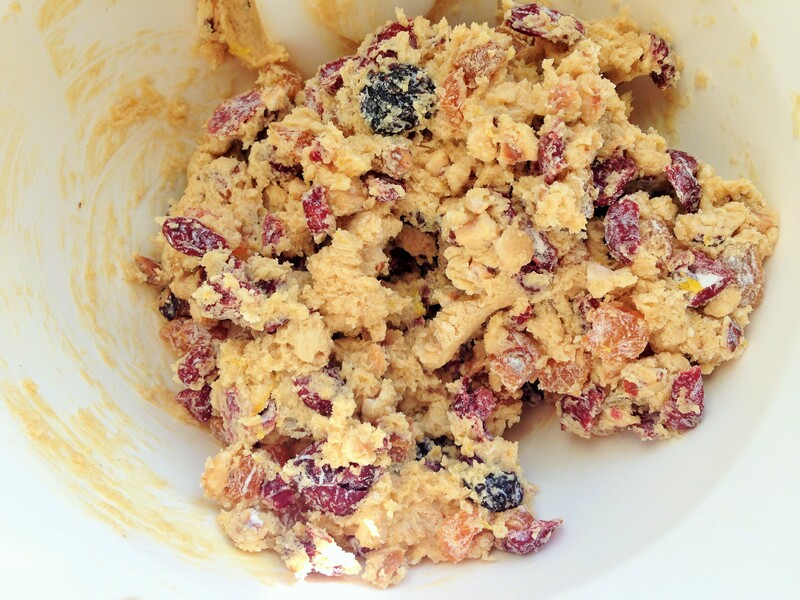 If you have time or remember to be so organised as to start this the night before baking, put the chopped dried fruit in a bowl with the orange juice and allow to soak over night. The next morning, strain away any liquid not absorbed by the fruit. To make the dough, put the flour, salt and butter into a large bowl. Rub the butter into the flour until it resembles fine breadcrumbs. Add the milk, yeast and egg (add the orange zest at this point if using), and mix together to form a dough. Turn the dough out onto a lightly floured surface and knead a few minutes, It is a slightly sticky dough so just bring it together until roughly smooth. I like to do this by hand, as it can become quite sticky if using a stand mixer and you might be tempted to add extra flour which I can tell you from experience is a bad, bad idea. Transfer dough to an oiled mixing bowl. Cover with cling film and then set aside to rise in a warm place for 1 hr (I place it on top of a luke warm hot water bottle). When the dough has nearly doubled in size start your filling. In a mixing bowl, cream the butter and muscovado sugar until fluffy. 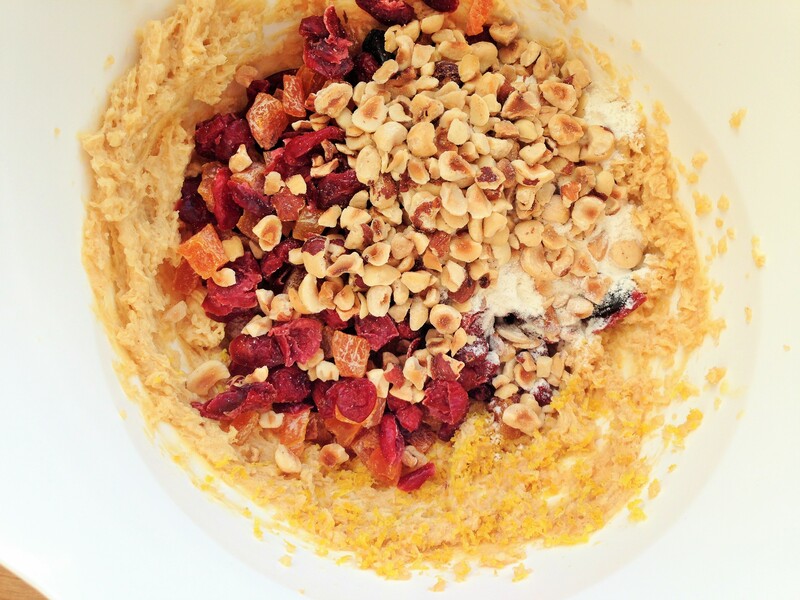 Mix in the dried fruits, flour, lemon zest and hazelnuts and stir until well combined. Turn the risen dough out onto a lightly floured surface. Roll it into a rectangle, about 25 x 33cm. 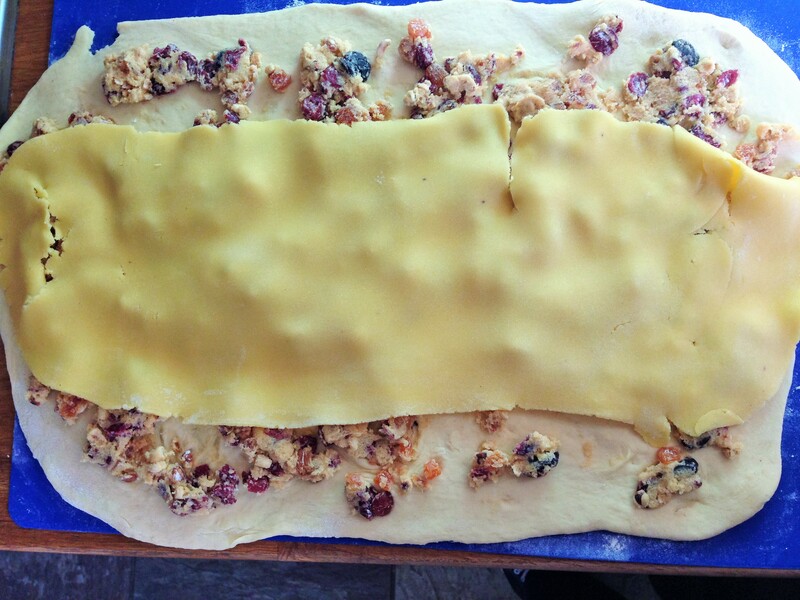 Evenly spread over the apricot mix, it can be quite stiff so I tend to scatter the filling over the dough. Then roll out the marzipan and lay it on top (it doesn’t have to cover the dough entirely, I usually get it rolled out to about 2/3 rds the width of the dough). Roll up the rectangle tightly so it looks like a Swiss roll. Then cut lengthways along the roll. 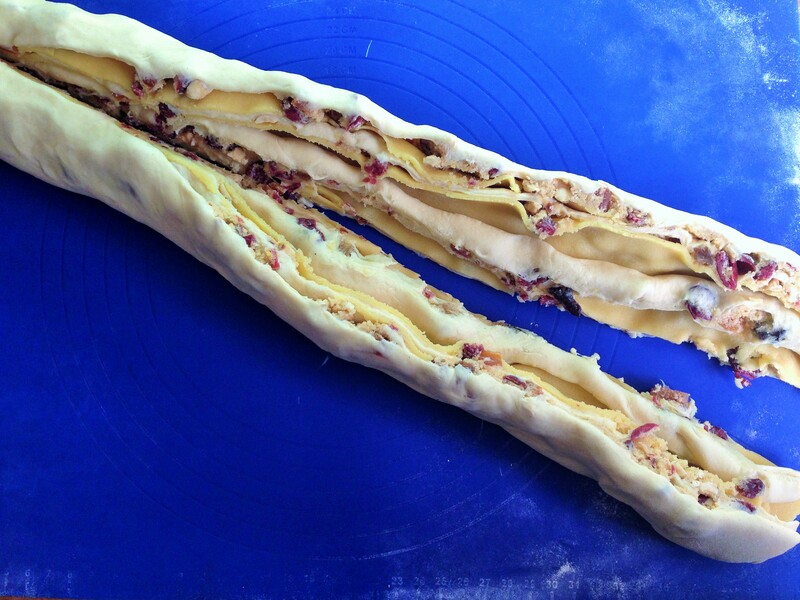 Twist the 2 lengths together (like a plait), then shape into a ring on a baking sheet lined with baking parchment. Loosely cover with cling film again and set aside to rise for another hour. Heat oven to 200C/180C fan/gas 6. Bake the twist for 25-30 mins until risen and dark golden.The marzipan can ooze out at this point, don’t worry, you can trim the excess away. Towards the end of the baking time, gently warm the apricot jam in a small pan. 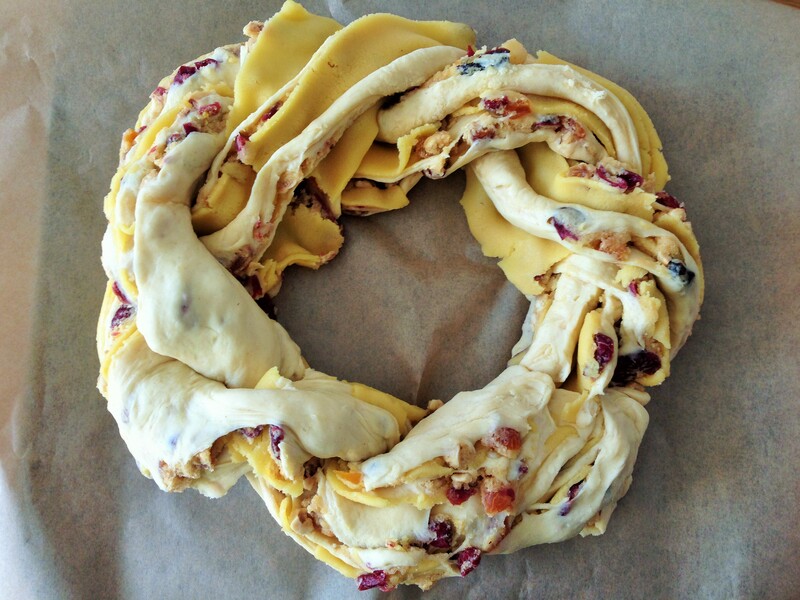 Once the couronne is out of the oven, brush the bread with the warm jam to glaze it and set it aside to cool. Once cooled, drizzle the twist heavily with the runny icing and scatter the toasted almond slices on top.